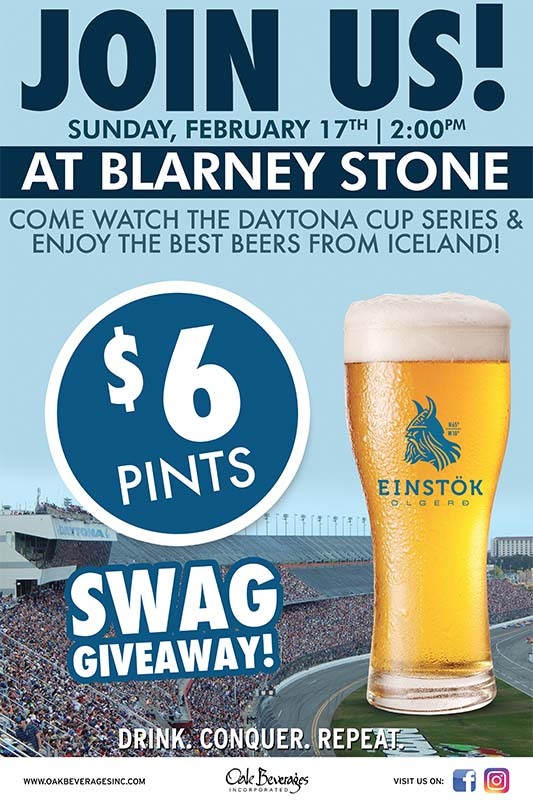 Blarney Stone Publik House Daytona 500 with Einstok - Oak Beverages Inc.
Blarney Stone Publik House Daytona 500 with Einstok, Sunday, February 17th, 2pm. Swag giveaway and $6 pints during the event, come drink, conquer, repeat and unleash the racing Viking in you. Daytona 500 featuring Einstok Brewing company at Blarney Stone Publik House. Come and watch the Daytona Cup Series and enjoy the best beers from Iceland! This is more than a slogan – it’s a way of life – and may not mean exactly what you think. This is the battle cry for modern Vikings and it calls them to the great adventure that lies ahead. Come join us at our family owned and operated Irish pub for some great food and drinks and excellent service. Posted in Featured Promo, Nascar, Pint Night.